An easy to use, affordable and rugged removable disk cartridge. 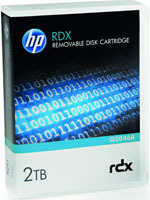 Now Available at BackupWorks.com the all new HP RDX 2TB RDX Cartridge part# Q2046A. The HP RDX Removable Disk Cartridge provides data protection for workstations and entry level servers. Used with an RDX docking station, it is the ideal backup solution for remote locations and single server businesses who want to focus on running their business, not their backup. The all new 2TB Cartridge with available compressed capacity of up to 4TB (4000GB). The HP RDX 2TB Cartridge is also fully compatible with Dell RD1000.